This AMT/Ertl model is 19 inches long and is in 1/1400 scale. 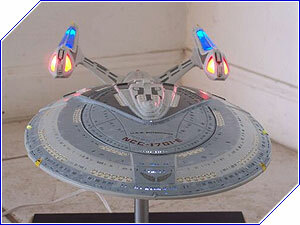 This model can be built, painted and/or fully lit to look exactly as it did in any of the The Next Generation Star Trek movies in which it appeared. Each of the movies featured this Enterprise with slightly different paint schemes and we offer each choice to our customers. Please contact us for more detailed information about the differences.